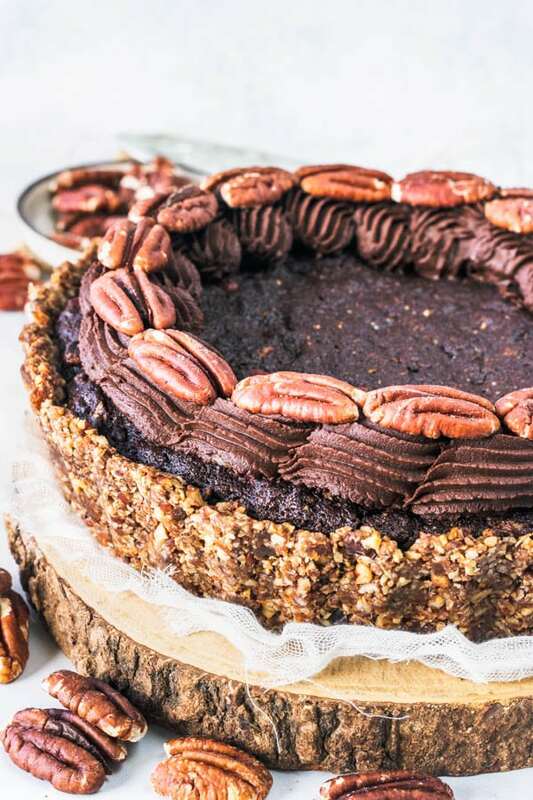 Guys, I have the perfect vegan dessert for you today!! 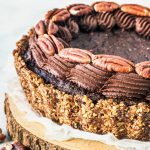 Pecan Brownie Vegan Pie! 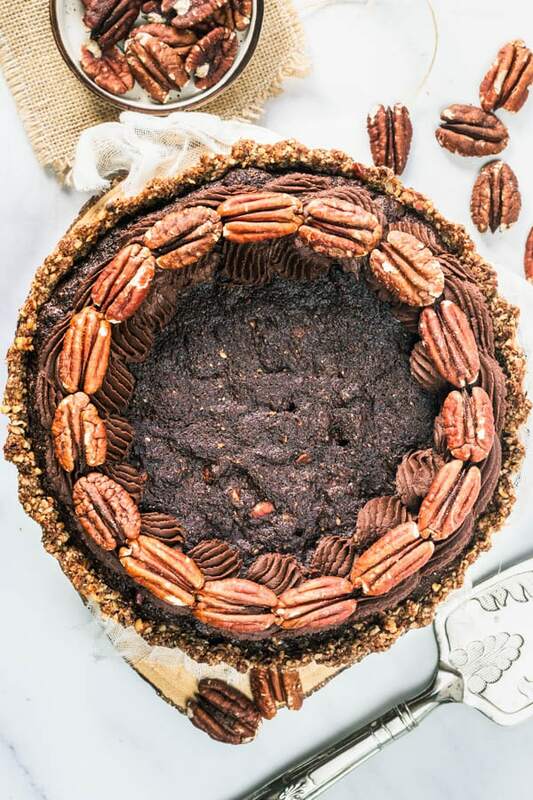 This Pecan Brownie Vegan Pie is also paleo, refined sugar free, gluten-free, dairy-free, which all my other vegan desserts also are. I am not a vegan. However, I enjoy vegan and paleo baking more than you can imagine. 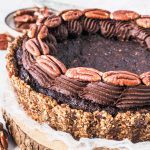 And that’s because of all the awesome ingredients that are usually involved in vegan and paleo baking, such as nut butters, coconut oil, maple syrup, dates, and of course, there’s chocolate involved. And I am not saying I will become vegan anytime soon, or even ditch butter and white sugar from my pantry. I won’t, at least not for the time being. I don’t believe it’s that awful to have a slice of cake, or a macaron every now and then. Nowadays, we have more access to information we didn’t before regarding the consequences of eating refined sugar, white flour, industrial vegetable oils, and stuff like that. So I am willing to explore options of “healthier” baking if you even want to call it that. I don’t want to get into the argument of what defines “healthy”. Anyway I am trying to learn how to make desserts with more natural, less processed ingredients. And that’s it for now. 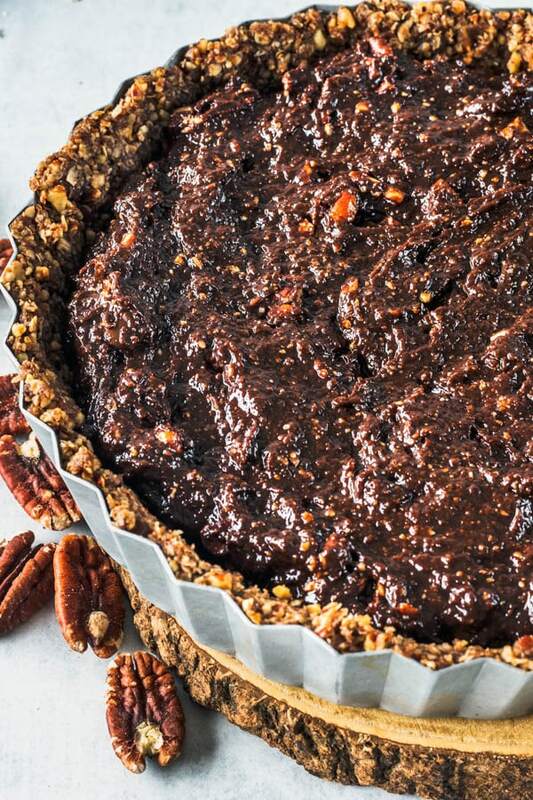 So let’s now talk about how to make this delectable Pecan Brownie Vegan Pie. We are going to start with a very simple Pecan Crust. Done in 5 minutes. Just throw all ingredients in the food processor and let it do its job. The mixture will be very clumpy and “wet”. 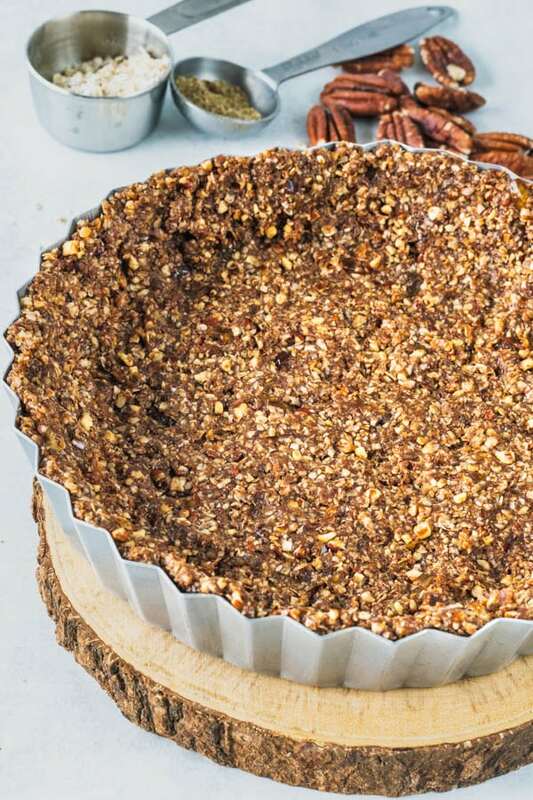 Press that mixture onto the bottom of your favorite tart pan. This is mine, I got it for like 50 cents in Brazil. I like it cause it’s so deep! So it allows my tarts to have a thick layer of filling, which makes for a beautiful slice like you saw above! Alright. Crust is pressed. Take a picture. That crust is delicious, it was hard not to keep snacking on it while I was trying to line the bottom of the tart pan with it. Place crust in the freezer to firm up while you make the brownie filling. 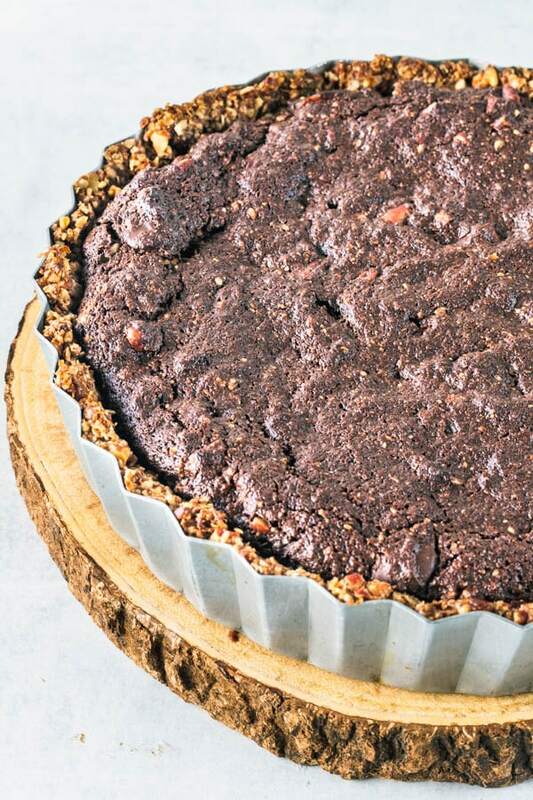 Now we pour our brownie batter over crust of our vegan pie. And then bake your vegan pie. Let it cool. All the way. And then garnish it with the Vegan Ganache. Check bellow some tips to achieve the vegan ganache piping consistency. To make the vegan ganache ready for piping, you must first chill the ganache until firm in the fridge for at least a couple hours. And then, you must let it come to room temperature on its own, which will take a couple hours sitting on the counter. So be aware that you need to make your ganache way ahead. Then, after the ganache has come to room temperature, you can grab a whisk and vigorously whisk the ganache until smooth. And then it should be ready to pipe. 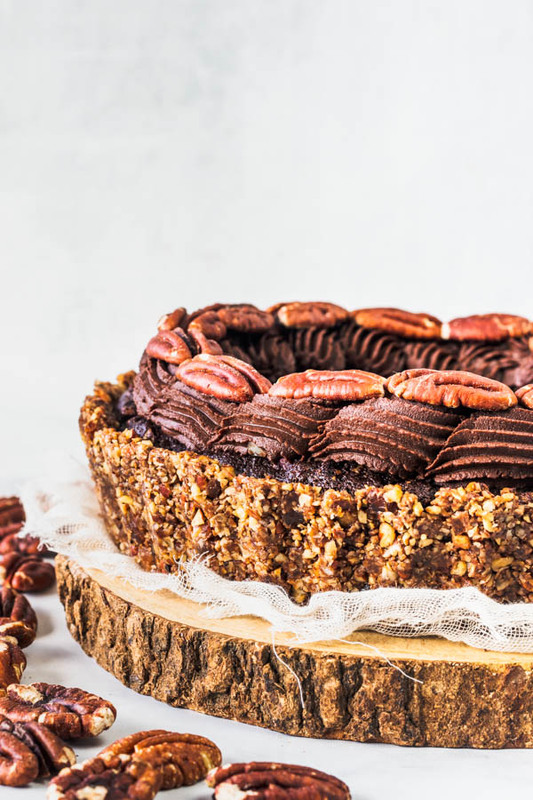 Other delicious toppings for this Pecan Brownie Vegan Pie could include: whipped coconut cream, or yogurt of whatever kind you like. 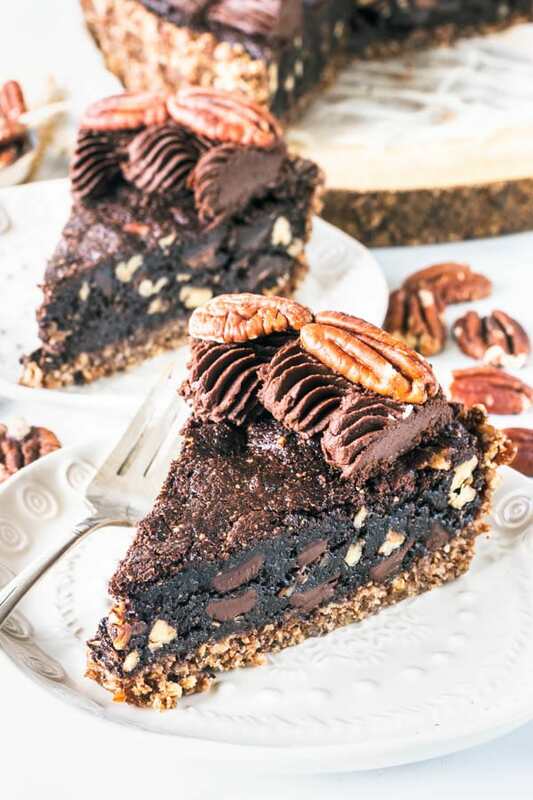 This Pecan Brownie Vegan Pie will be perfect for your end of the year celebrations. 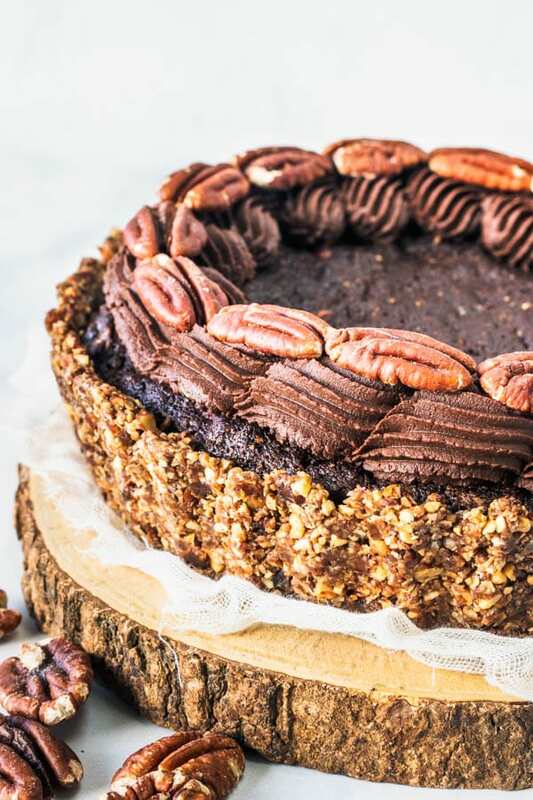 Even if you are a vegan and want to bring this treat to a party, I am sure non-vegans won’t mind at all! It’s so delicious, even my husband was converted. 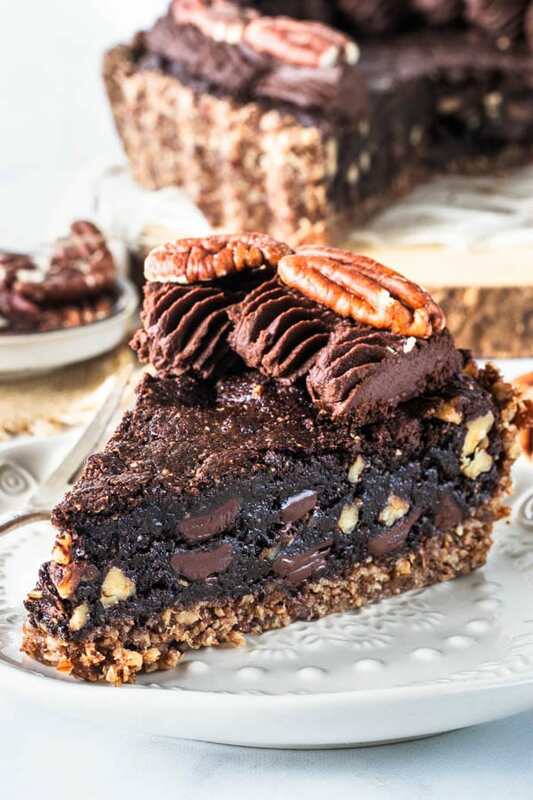 Actually I dare say this Pecan Brownie Vegan Pie is the most perfect, fudgy, delicious brownie pie I’ve ever had! I hope you all liked my pie as well. 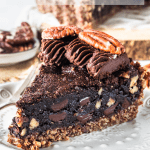 If you like vegan recipes, you might want to check some of my post popular ones: Fig and Pistachio Vegan Cheesecake, Vegan Brownies with Caramel Sauce, and Vegan Cookie Dough Bars. 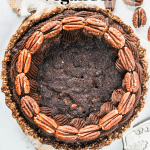 This Pecan Brownie Vegan Pie is also paleo, refined sugar free, and gluten free. Perfect for the holiday table, or just to snack on with some yogurt scooped on top, which is my favorite way of eating it. 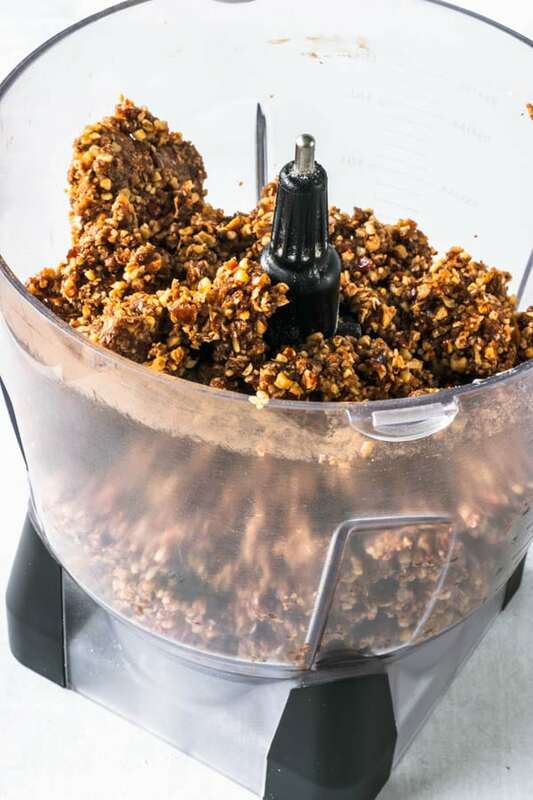 Place all ingredients in the bowl of a food processor. Process until everything is well incorporated. Press onto the bottom and up the sides of a pie plate. 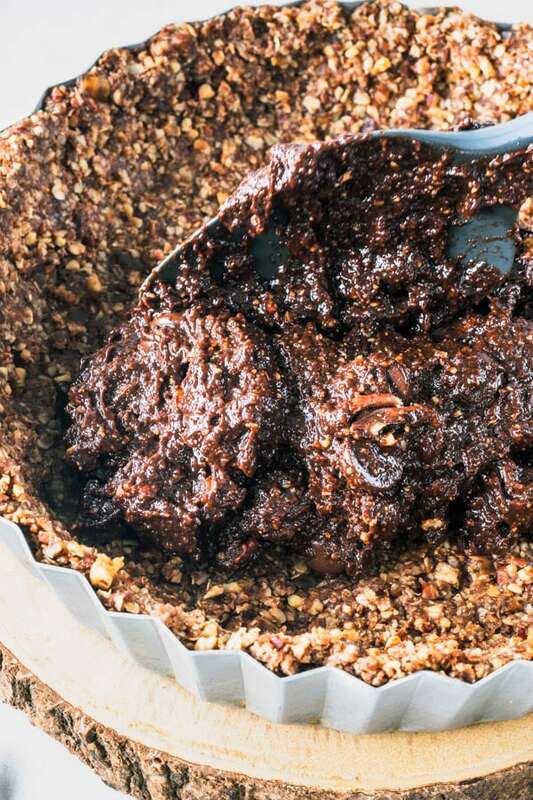 Put it in the freezer while you make the brownie filling. In another bowl, add 1/2 cup chopped chocolate and coconut oil. Place on top of a pan of simmering water. Mix with a spatula until incorporated. Add remaining 1/3 cup chopped chocolate and the nuts. Mix until combined. Pour brownie batter over chilled crust. Bake for 20-30 minutes, or until done. You’ll know when the brownie is done baking, because a toothpick will come out clean when inserted in the brownie. 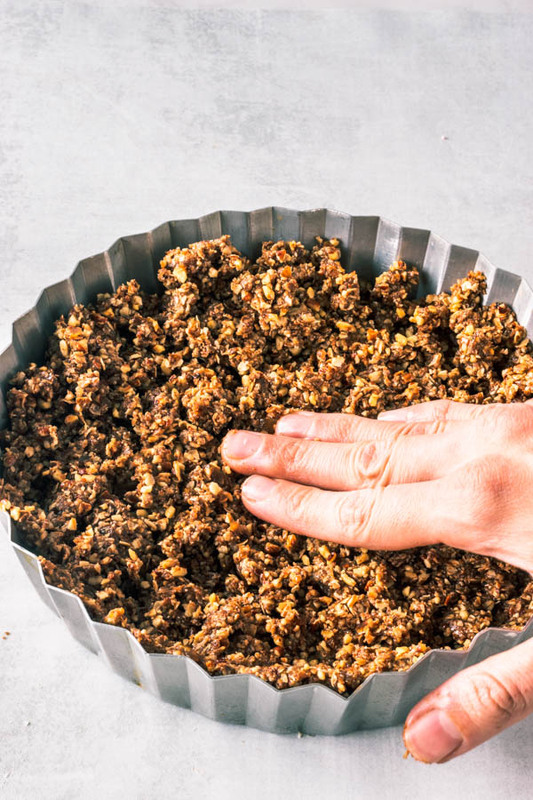 Or you can test it by touching the top of the brownie with your finger and if it seems firm, and springs back, then it means the brownie is done baking. Remove from the fridge, let it cool completely before piping the ganache on top. Heat coconut cream in a small saucepan or microwave, until before it comes to a boil. It shouldn’t actually come to a boil, but just get really hot. Pour hot coconut cream over chocolate. Let it stand for one minute. If there are still bits of chocolate that didn’t melt, just insert your bowl in the microwave for a few seconds at a time, stirring in between, until every bit of chocolate has melted. Let it cool down. Place it in the fridge for a couple of hours until it firms up completely. Pull it out of the fridge and let it come to room temperature. Whip it with a whisk to smooth it out, and you can then pipe it or spread it. Getting the consistency for piping can be tricky, but after some practice you’ll be able to tell what consistency you need to have in order to be able to pipe the ganache. Just make sure it’s at room temperature but not warm, and also make sure it’s not cold, or you will have lumps of chocolate in there. I would definitely go with the ganache topping! I’m a sucker for ganache! Que maravilha!! Dá água na boca!